Today started OK, but by the time we’d filled with water at the BW yard, it had started to rain. 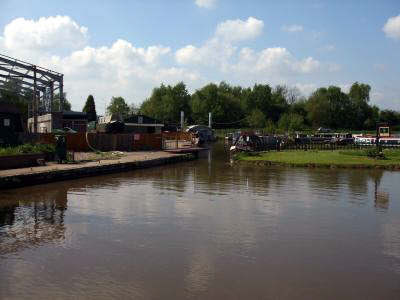 We got on the move properly at 10:30, on the last leg of the Coventry Canal to Hawkesbury Junction. 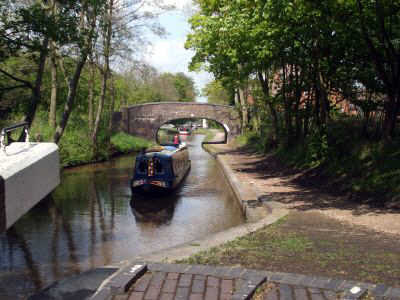 The canal was built initially to carry coal from the many collieries in the area north of Coventry. It is now mainly rural, but there are glimpses of an industrial past with disused railway bridges and odd concrete structures of indeterminate function along the navigation. 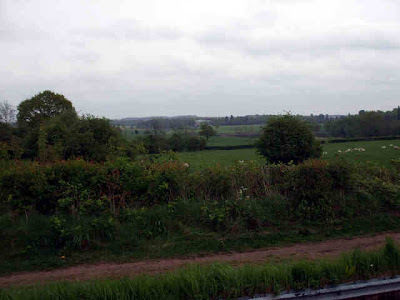 These bits contrast sharply with views over the farmland in the River Anker valley to the west. 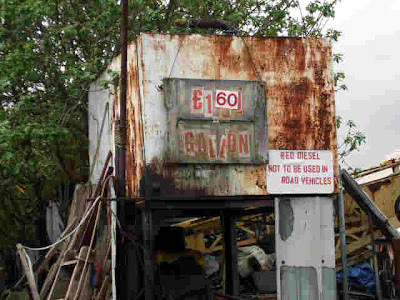 Nuneaton was reached all too quickly, and it hasn’t changed it’s nature since the last time we came through. There’s a settee and 2 chairs in the water near Bridge 19, and a TV a bit further on. Still, it’s good to see the locals have found a use for this amenity. There was one saving grace. 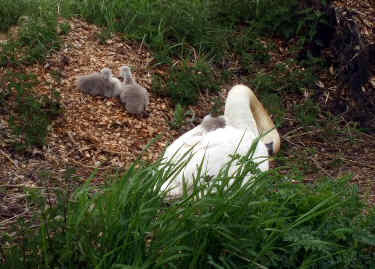 Just outside the town I spotted our first brood of cygnets. Out of the town, there’s a short section of open country that still bears the scars of quarrying in places, then the Ashby Canal joins from the right at Marston Junction. This is another navigation that was built to carry the black diamonds, this time from the coalfields around Moira and Ashby de la Zouch. 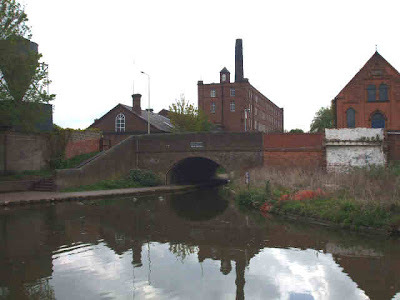 Sir Francis Newdigate had discovered coal on his extensive estates around Nuneaton and Bedworth, and constructed a network of canals and tramways to ship it to the Coventry Canal. Some of these are still visible in Arbury Park. 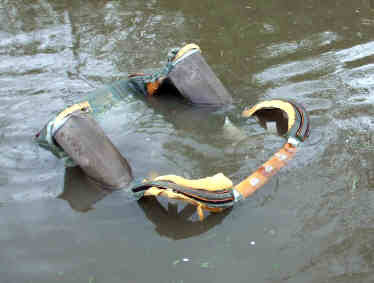 The only evidence from the canal though is the remains of the linking arms for Griff Colliery and Newdigate Colliery. 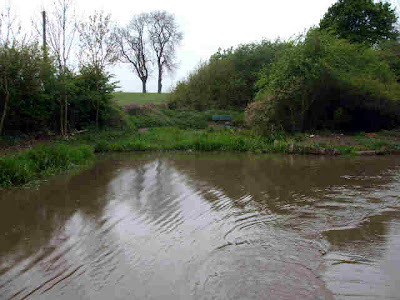 Newdigate Colliery Arm near Bedworth Hill Bridge, no 13. 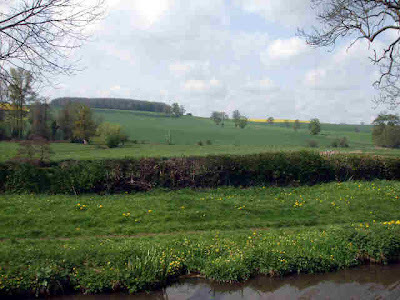 From Marston Junction the canal makes it’s way to Hawkesbury Junction in straight sections, with bends to left or right separating them. On one of the bends is Charity Dock, which still seems to be in a timewarp. It doesn’t appear to have changed since we first came this way, 2½ years ago. 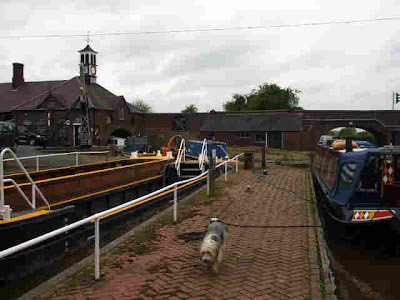 Hawkesbury Junction, with it’s engine house for pumping water up from a well to the navigation, is about 2 miles from Marston Junction. The engine house used to be occupied by a steam engine (called “Lady Godiva”), which spent the first 100 years of it’s (her) life pumping water from the levels of Griff Colliery. Another 92 years later, in 1913, the old girl was retired and now rests in Dartmouth Museum. Why Dartmouth, I don’t know. 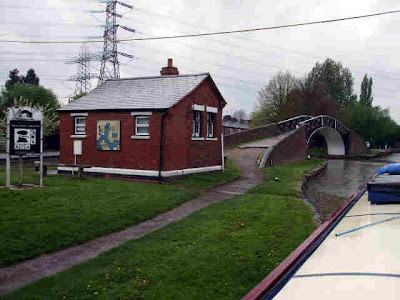 The distinctive (and much photographed) towpath bridge over the junction with the Coventry Canal. It was at the junction, in Sephton’s Yard, that Frank and Rose Skinner’s boat, “Friendship”, was built in 1924. 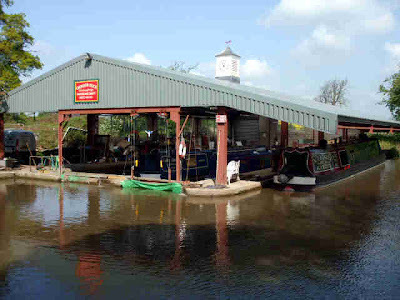 I took a photo of her, now under cover at the Ellesmere Port Boat Museum. 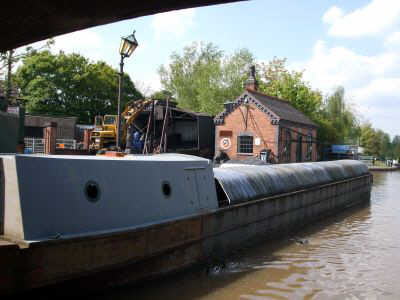 Having filled with water at Hartshill, we just got rid of the rubbish and emptied a loo tank before climbing the 12” rise at the stop lock onto the Oxford Canal. Having initially described a series of sharp bends under a mess of electricity pylons, the canal then makes it’s mind up which way it’s going and heads off south east, alongside the M6. The rain on the tarmac made it noisier than normal today. 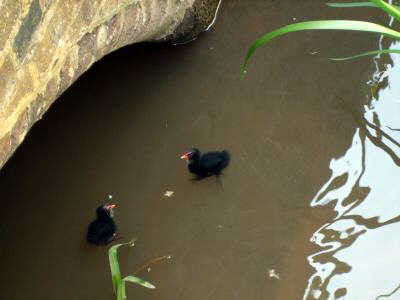 Then it loses it’s way again for a bit, wiggling along to Ansty, and ducking under the M69 on route. We pulled over here, just before Bridge 15. They start begging early around here! It’s rained pretty much all day, with varying degrees of intensity. But with only the one lock (?) to do, it’s not been so bad. 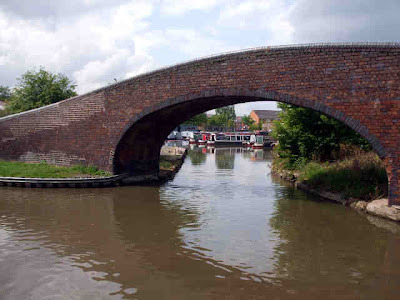 Apart from the short section between Braunston Turn and Napton Junction, (now part of the Grand Union network), we’ll be staying on the Oxford Canal till – you guessed it – Oxford. About 2 weeks away. A beautiful day for locking. Wall to wall sunshine after a misty start. Off at 10, after watching one of our overnight neighbours leaving. Hotel Boats Duke and Duchess heading north. Not BW cut-backs this time. 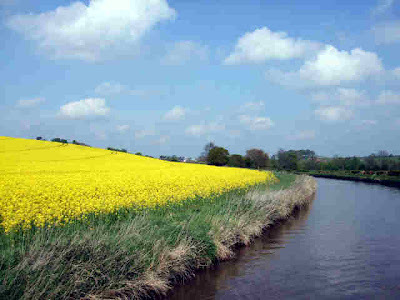 Cruising through the beautiful Warwickshire countryside (we left Staffordshire yesterday this side of Tamworth) the gentle breeze brought the sweet, musky scent of rapeseed pollen. 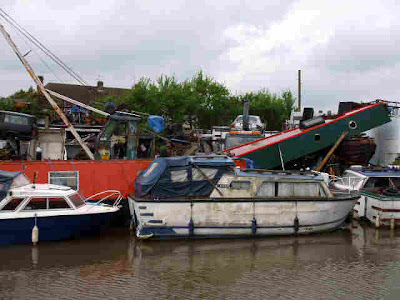 Grendon Dock, home of Narrowcraft, looks busy. 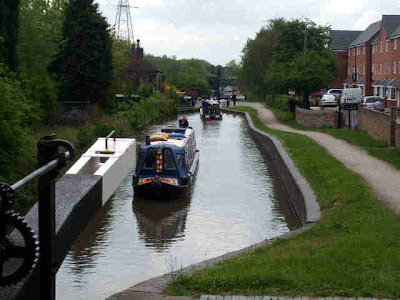 Atherstone Locks was the main focus of the day. 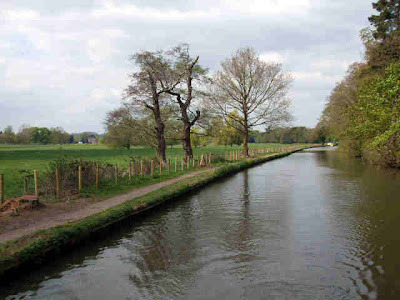 11 locks, lifting the canal around 90 feet, starting in farmland, running through housing and finishing on the southern edge of this small town. The flight is pretty and well maintained, though all the locks are slow to fill. 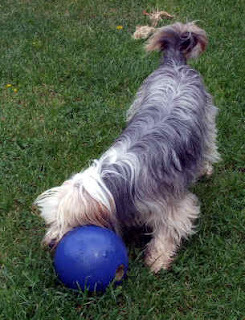 Still, it does mean that there’s less chance of broken crockery! The resident lock keeper works from the cottage at the top of the flight, though we’ve never seen him about. 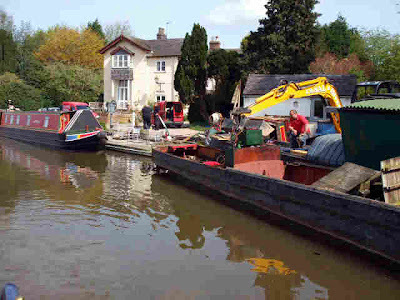 Baddesley Wharf, home of another boatbuilder of distinction, Barry Hawkins. 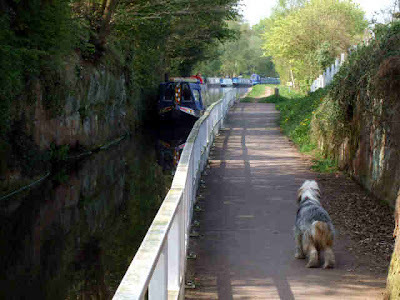 Another couple of very pleasant miles took us to Hartshill, where we pulled in just before the BW maintenance yard. It’s busier here than we expected, we just managed to get into the only boat sized slot left. 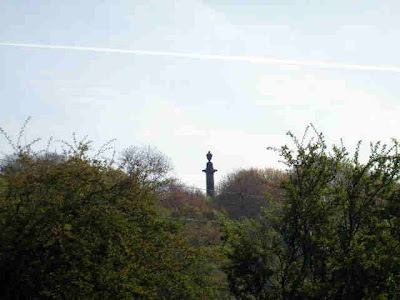 Just visible over the top of Seyella is the clock tower at the yard, and to it's right is "Mount Judd", the conical spoil heap from Judkins Granite Quarry. It’s been a fine, warm day. I was even able to dispense with my fleece pullover at noon, but had to put it on at the top of the flight. Forecast for the next couple of days is a bit grim, with wet and windy weather moving in. We’ll have to see what we’re going to do. We’re still well on schedule for Oxford in the middle of next month. I was just finishing off on my laptop at about 10 to 9 last night when I heard the putter of a diesel engine approaching. My first thought was that it must be a hire boat, behind schedule, to be moving at this time of night. But I was wrong. 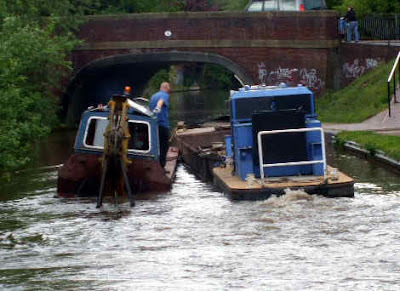 It was Andrew Denny on NB Granny Buttons, heading towards Fradley. He does keep odd times! We were away at 09:00 this morning. It was a grey start to the day, and just a bit damp around noon. But there were also bright spells as the sun showed it’s face. We were overtaken by 2 boats in the first couple of miles. 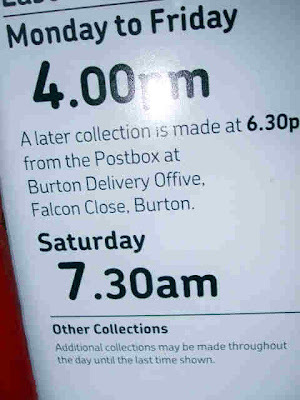 People with urgent business elsewhere, I guess. Continuous Cruisers Moorers mooorings at the Plough Inn, Huddlesford. 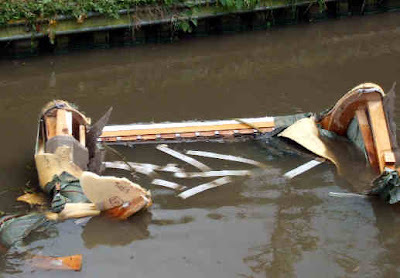 ….who use the remaining stub of the Wryley and Essington Canal for moorings. The derelict near Whittington seems to have sunk further into the mud since the winter. 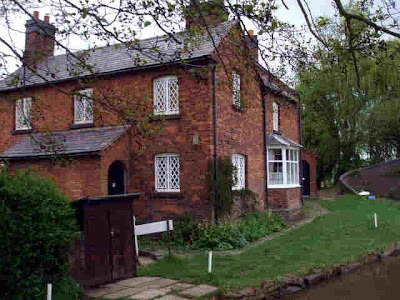 A steady cruise took us through the farmland around the village, through Hopwas Wood and the village, and on to Peels Wharf. 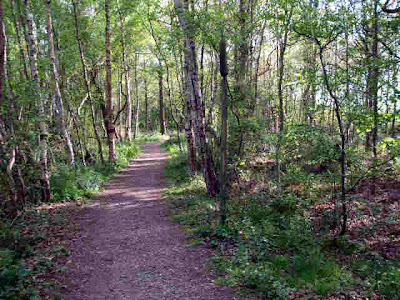 Delightful Hopwas Wood. A pity it’s a firing range…. Waiting to get onto the wharf at Peels Wharf. 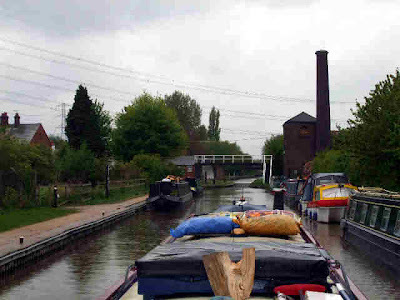 Having filled the water tank yesterday it was just a case of emptying a loo, then we were on the move again, around the corner and straight across the junction carrying the canal to Birmingham. 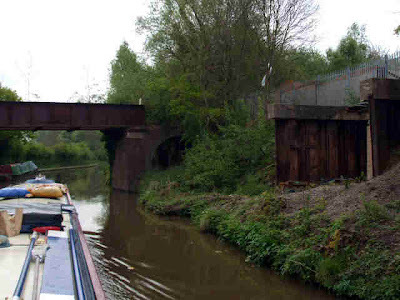 We went straight on, into Tamworth, narrowly avoiding a close encounter with a pair of workboats at Bridge 76. 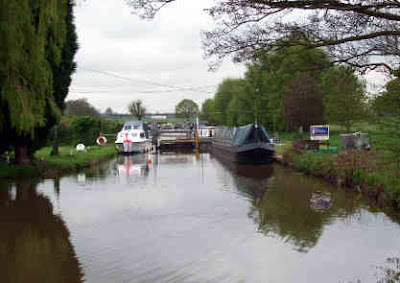 Glascote Locks was the next landmark (watermark??). Hudson’s have a well deserved reputation for quality boats, with fine lines and classy interiors. 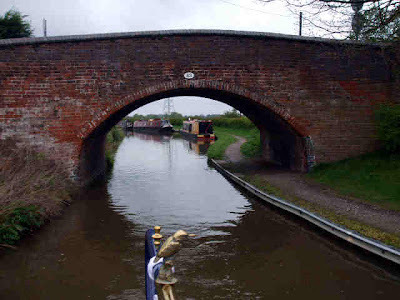 The last couple of miles to Polesworth were uneventful, apart from sharing the bridge ’ole at the pipe bridge near Alvecote with a hire boat. 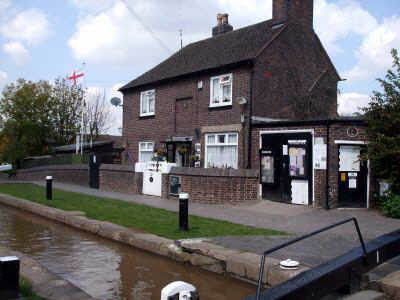 We both got through, with an inch or 2 to spare..
We pulled over on the Polesworth village moorings. The one boat that was here when we arrived left almost immediately. Nothing I said, I hope. It was handy, him going. TV reception is very poor here, with a high bank to the right where you need to point the aerial. You need to be near the end of the moorings to be clear of the bushes on the left to use the satellite dish. There’re another 5 boats here now. But we’ve got the best spot for TV. So today we’ve had a long mainly dry day, to make up for a short wet one yesterday. It's been warmer today, as well. No longer T shirt weather, it's back to boots and jackets. But I'm still persevering with the shorts! Sitting in the sun, cruising in the rain. We had a good long weekend up at Shadehouse. Warm sunny weather meant plenty of opportunity for sitting on the bank watching the boats coming and going. In fact, there was one particular hire boat that came, went, came back again and then left before us this morning! There were only a couple of showers on Saturday morning to dampen things a little. 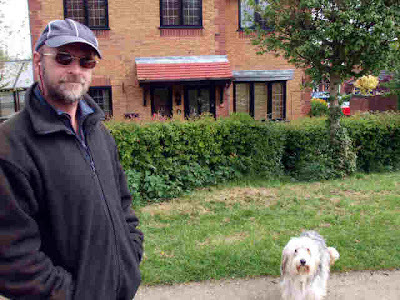 Meg and I had some very pleasant walks around the area. Yesterday I “vegged out” in front of the TV. First it was coverage of the London Marathon, then the Bahrain Grand Prix. I really enjoyed both, in fact watching the marathon has finally pushed me into entering myself next year. I’m entering through the ballot, so have only a 1 in 3 chance of getting a place anyway. I could probably secure a place through Cancer Research UK, but doing so would require me to guarantee raising a “Golden Bond” of £2000. I reckon I’d be struggling to do that. And I bet that Ross Brawn and Jensen Button cracked a few bottles of champagne last night. 3 wins out of 4 races is an impressive record so far. Anyway, we decided to move on today. After all, we’ve got to be in Oxford in 3 weeks time! Of course, after a mainly dry couple of weeks, it had to be raining this morning. So we hung on till mid afternoon to catch a break in the showers. 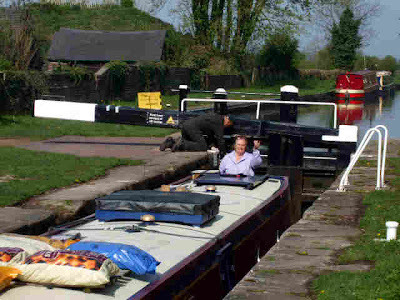 The sun was shining and there were patches of blue sky as we dropped down Shadehouse Lock, but the respite was short lived, and we were filling the water tank at the tap at the top of the Coventry in a heavy shower. 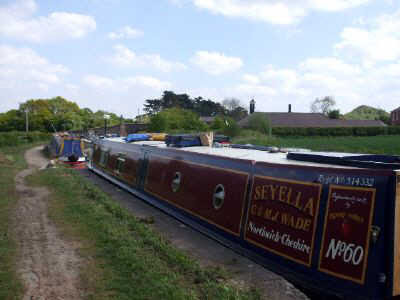 We pushed on with the rain easing, and by the time we pulled over soon after Streethay Wharf the sun was shining again. 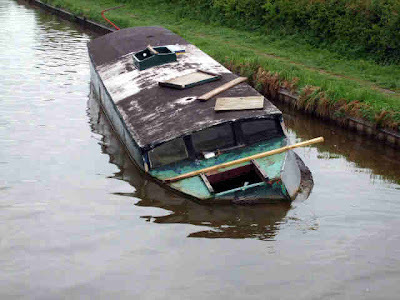 It’s a lot quieter on the Coventry than on the Trent and Mersey. We’ve not seen a boat moving in the last 3 miles, but we saw a good half dozen in the first mile. Chicks by the dozen, boats by the score. 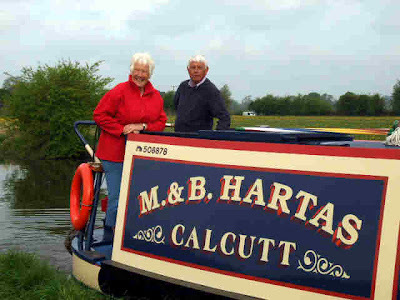 Malcolm and Barbara were off on NB Pilgrim at around 09:00 this morning. We followed on a bit later. 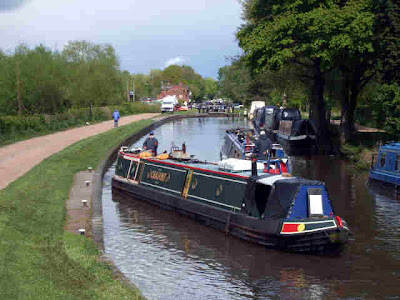 We’d not intended to stop at Rugeley for shopping, I was going to get anything we needed on Saturday at Fradley Stores, when I went up for the mail sent to the PO. But when I set out to make a loaf of bread, I realised I’d used up the flour on the last one. So we had to stop anyway. 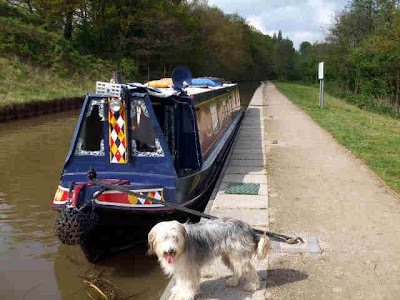 I made a quick trip to Morrisons, and we pulled off the mooring which was immediately taken by another boat. 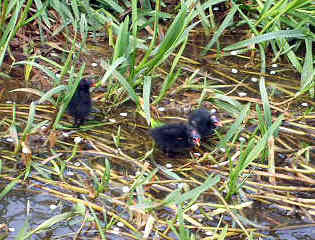 There were lots of ducklings in the town, and also a family of moorhens. 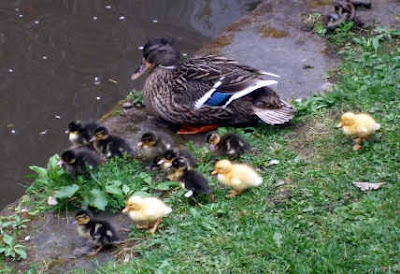 I’d don’t recall seeing so many youngsters around last year, maybe it’s the mild weather. 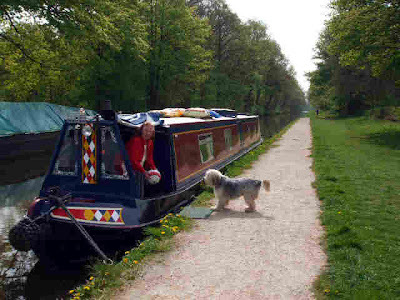 At Armitage, where the canal narrows, I hopped off with Meg to check for oncoming traffic while Mags brought the boat through. In the narrows. Come on, Mum. Keep up! 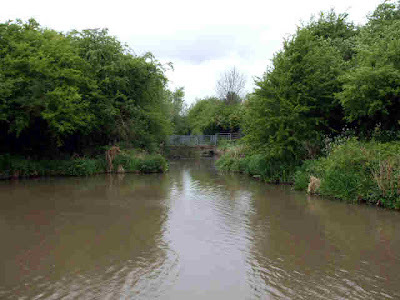 Then we had a bit of a walk along the towpath, between the railway and the Armitage Shanks factory. 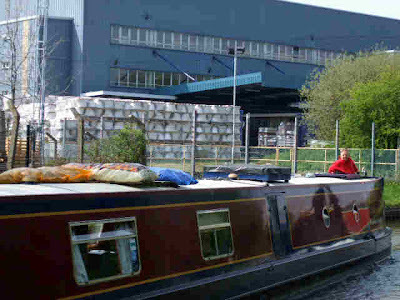 We pulled in above Shadehouse Lock at 14:30, after another lovely sunny day. Looks like the weather’s on the change though, with rain over the weekend. Mags, Meg and Ball at Shadehouse. We’ve seen a regular convoy of boats heading north today, and quite a few in both directions since we moored. Can’t wait till the weekend…..
Another fine, dry day after a cool night and foggy morning. But it has been a little colder today. Alternating between fleece pullover on and off, in time with the appearance and disappearance of the sun! 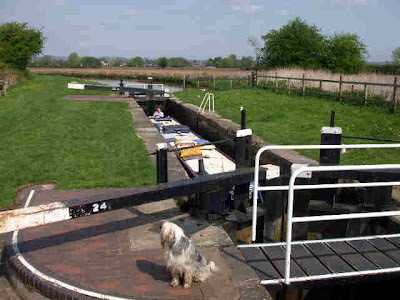 Even though we were following a couple of other boats, we saw no sign of them, only the locks left empty as they moved on. 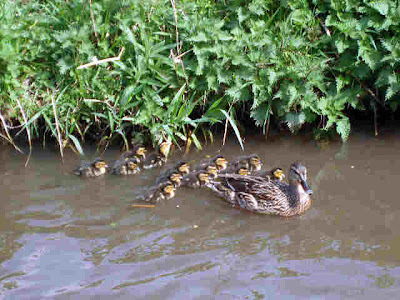 It was no chore having to refill them as we arrived, in this superb countryside there’s absolutely no need to rush. At Sandon Lock a BW chap was finishing off a gate repaint, and very smart the lock looked too. 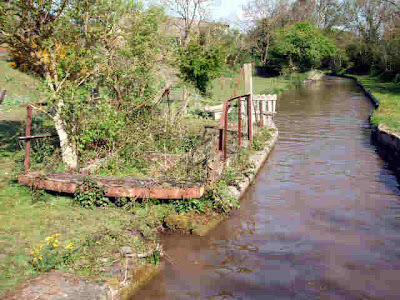 It was here in September 2006 that we had an enforced overnight stop, waiting for the boatbuilder to come and sort out a seized propshaft. 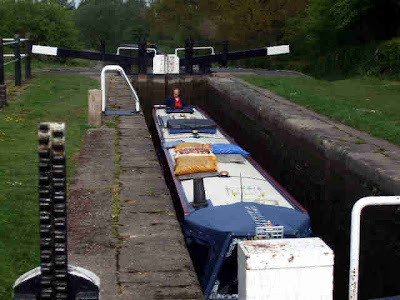 And we arrived at what I consider to be one of the most attractively set locks on the T&M. 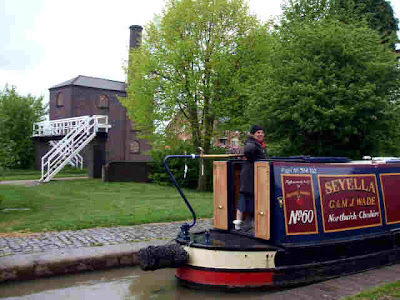 Hoole Mill was the last lock before we passed the recently opened Great Haywood Marina, a line of moored boats on the canal and arrived at Great Haywood. We pulled onto the water point to do the essentials. I’d just put the spare cassette away and was getting ready to set off when a voice on the bank said “You must be Geoff”. 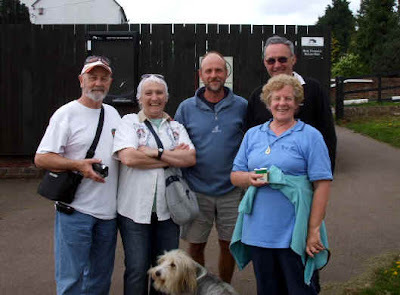 I popped my head up and stood there were Derek and Dot from NB Gypsy Rover, along with Eric and Patsy, a couple who are having a boat surveyed at the marina with a view to buying. Gypsy Rover is in there as well, having a few bits and pieces done. Surprise! Eric and Patsy on left, Derek and Dot on right, me and Meg in the middle. We must have spent nearly an hour, just chatting, before we went our separate ways. 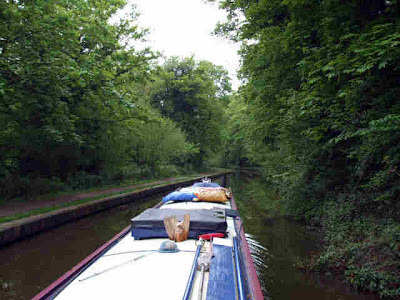 We went through Haywood Lock and along the straight beside the parkland of Shugborough Hall. 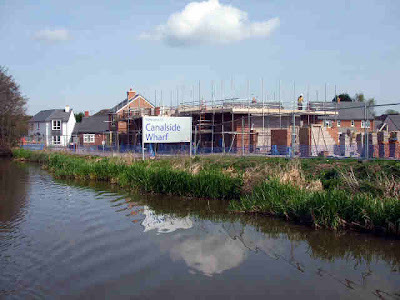 An awful lot of felling has been done along here, on both sides of the canal. We picked up some wood along here earlier in the year. 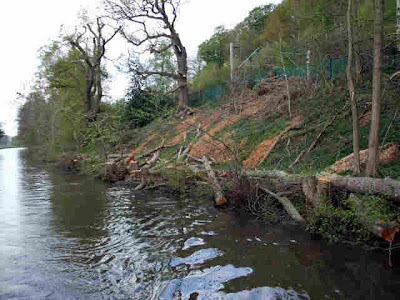 The contractors said they were going to be felling all but the oaks, on the orders of Staffs County Council, who are responsible for Shugborough Estate. They’ve certainly done that. 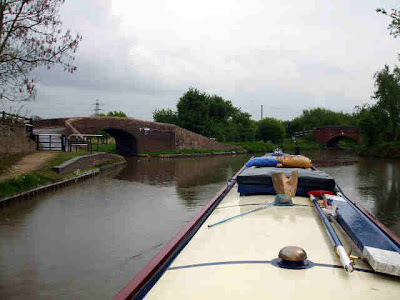 We pushed on through Colwich lock, always a bottleneck on summer mornings with boats leaving Great Haywood, and pulled over just past Taft Bridge. We were surprised at how busy this bit of bank is, there were probably 4 or 5 boats moored when we arrived. 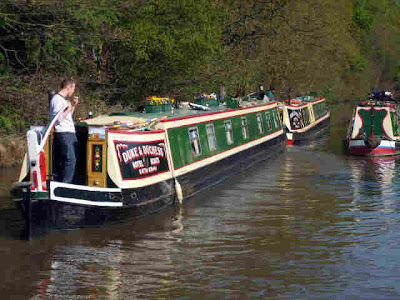 We moored in front of Malcolm and Barbara on NB Pilgrim, who we’d seen up on the top end of the Shroppie, near Chester Zoo, about 3 weeks ago. 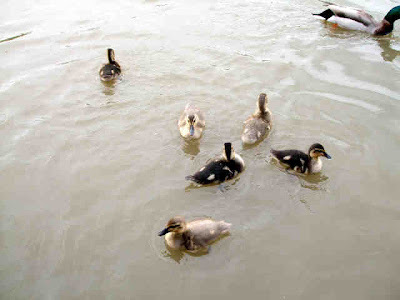 We invited them for a drink and spent a very enjoyable couple of hours swapping canal stories. I see the government has decided it needs to borrow £175 billion to balance it’s books for next year. That’s a lot of zeros. If you’re American, it might only be £175,000,000,000. But by the traditional British method, it would be £175,000,000,000,000. Which is 1000 times more. I wonder which notation Mr Darling is using… Either way, it makes your average mortgage pale into significance, don’t it. Steadily up to Hassall Green. Back on the good old Trent and Mersey. A short cruise to a scenic view.